Diprose is Academic Dean at the Istituto Biblico Evangelico Italiano in Rome. This is part of his PhD dissertation. He is also an MA from Trinity University. This is an interesting look at the history of Replacement Theology from the church fathers through the Catholic Church to the Reformation. His thesis is that Replacement Theology is an aberration of Scripture due to the early church’s disdain for Israel and its adoption of allegorical interpretation. Diprose shows that Origen especially, as well as most Catholic fathers including Augustine, replaced Israel with the church and even based their form of church government on the priestly form of the Old Testament law. This affected everything from the biblical covenants, to the three-tiered arrangement of church leaders, to the sacraments, to a realized eschatology based on allegorical interpretation of the prophets. “For over nineteen centuries the Jewish people have been an object of contempt and suspicion. What has come to be called ‘replacement theology’ is widely perceived as being one of the causes of this attitude. According to this concept, Israel has been repudiated by God and has been replaced by the Church in the working out of his plan. 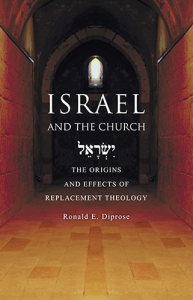 A variation of this idea is that true Israel always has been the Church” (p. 29). “Christian theology must be based on sound hermeneutical principles which presuppose the Church’s essential relationship with Israel. These include taking into account the whole of the biblical canon, taking seriously the Jewishness of Jesus and of much of the New Testament, recognizing the institutional distinctions between Israel and the Church, and giving normative value to what the New Testament teaches concerning both the first and second advents of Christ. In the early Christian centuries, neglect of these five principles favored the development of a theology of the Church and of the Christian ministry in which apostolic teaching was subordinated to Old Testament cultic practice. It also favored a medieval ecclesiastical theocracy in which the qualities of the messianic kingdom described in the Old Testament were notably absent” (p. 172).